14/02/2018 in Brain Injury Group News, News. In 2017, Phil Perry, Senior Operations Manager for Brain Injury Group associate member, Independent Living Solutions, took part in 17 marathons and ultra-marathons to raise money for his local children’s hospice, Julia’s House. Impressed by his exhausting fundraising efforts for the charity, which provides frequent respite care for children and practical and emotional support for families caring for a child with a life limiting or life threatening condition, Phil’s colleagues at ILS secretly entered him into the Spire FM and Salisbury Journal Local Hero Awards where last month he collected the Sports Achievement Award. Phil’s achievements included running the 100k Thames Path ultra-marathon in an impressive 11 hours and 27 minutes, taking 44th place out of 1,100 runners and burning nearly 7,000 calories in the process! During the course of the year he raised more than £1,700 for Julia’s House. We’d like to offer our own ‘congratulations’ to Phil on his efforts and much-deserved award. Independent Living Solutions operate from their head office in Wiltshire, providing case management and rehabilitation services on a nationwide scale. They have been members of Brain Injury Group since its formation in 2011. 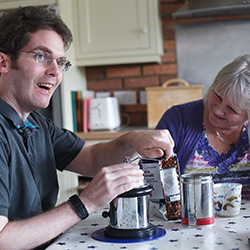 To find out more about Independent Living Solutions and the services they offer, click here.